Four years ago photography students at Wanganui Collegiate School began fundraising for the Sarjeant Gallery’s Thousand Stars programme, established to raise funds for the Sarjeant Gallery redevelopment project. 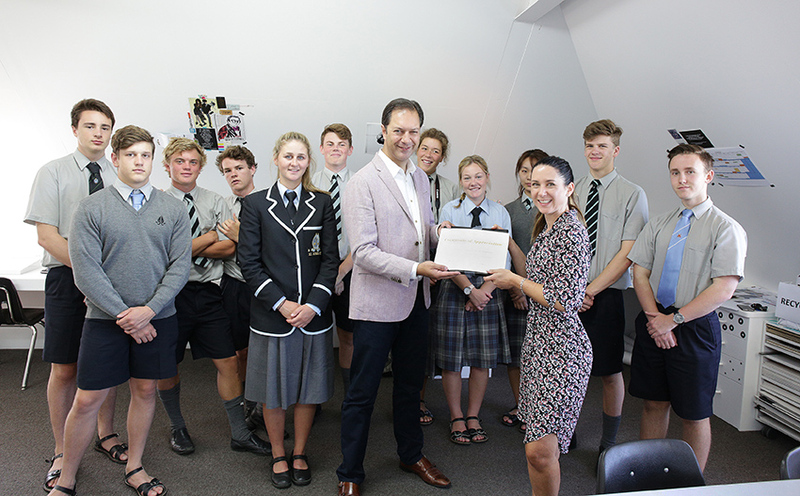 The students have reached their target of $1,000 and Greg Anderson, Director of the Sarjeant Gallery presented them with a certificate last Wednesday to acknowledge their full contribution. The money was raised through the sale of students’ photographic work exhibited annually at Jolt café on Victoria Avenue. Art teacher Catherine Richards said the experience has been hugely rewarding. Helping with fundraising for the redevelopment of the Sarjeant Gallery is particularly meaningful for art students. They appreciate its importance as a local and national resource Mrs Richards said. The fundraising has also been an excellent opportunity for the students to gain exposure. Some photographs have sold five or six prints, at $30.00 each, and recent exhibitions by senior students have covered an eclectic range of topics. An abstract photograph of Whanganui architecture was very popular, as was a Lego man riding a skateboard and another of an ice-block melting. One student gained a commission to photograph a wedding. Mrs Richards who took over the project in 2013 from former Head of Art Paul Collins, now at Whanganui Girls’ College, said students are encouraged to complete community service as part of their wider education. “That’s part of the school’s ethos and values – that you give back to the community and raise money for charities. Fundraising gives the students a sense of value.” She plans to maintain the school’s relationship with the Sarjeant by taking students on visits, showing them that the art gallery is a friendly place and a resource to visit frequently.